1 Heat oil in large skillet over medium heat and cook garlic 30 seconds. Add beef and cook over medium-high heat 1 minute or until almost done. Stir in wine and Worcestershire sauce and cook 30 seconds; remove beef. 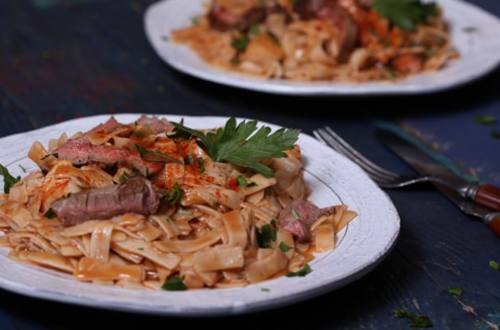 2 Stir water, milk, Spread and Knorr® Pasta Sides™ - Stroganoff into same skillet. Bring to the boiling point and continue boiling, stirring occasionally, 7 minutes. Stir in onions and beef, then cook 2 minutes or until noodles are tender. Garnish, if desired, with chopped fresh parsley and paprika.